We at CatSynth feel there is no better way to celebrate Superb Owl Day than with “owlsynth pics”. 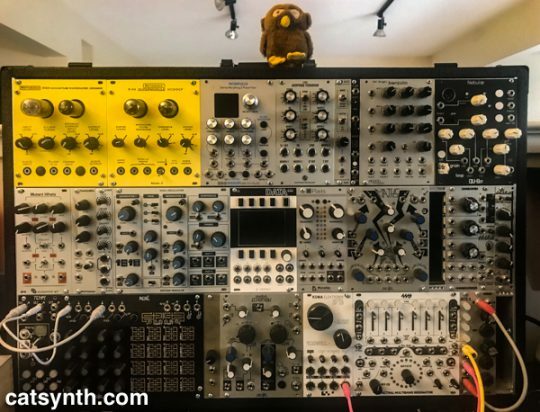 Here is our stuffed owl atop our main modular system. 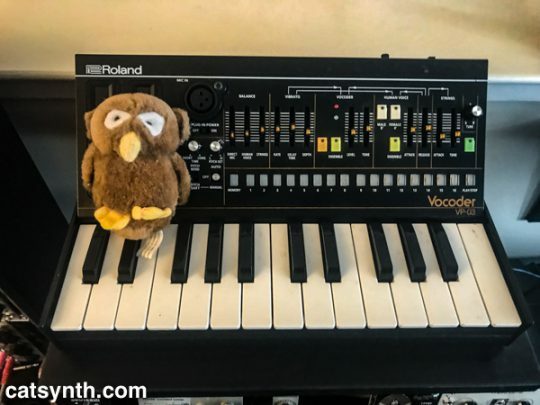 And with our trusty Roland Boutique VP-03 vocoder. 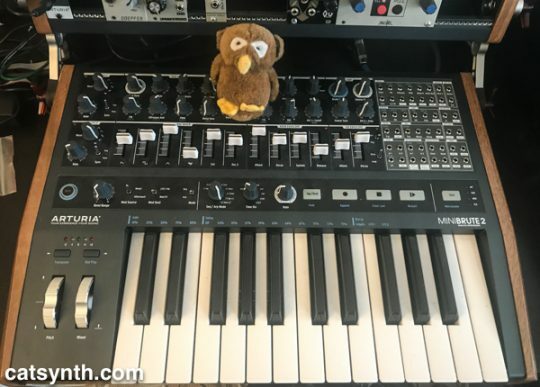 And with our Arturia MiniBrute 2. Owls are quite captivating as they are so different from other birds, even from other birds of prey. We all know their unique front-facing faces and nocturnal behavior. But they also have amazing auditory capabilities. Both the cat and the Barn Owl have much more sensitive hearing than the human in the range of about 0.5 to 10 kHz. The cat and Barn Owl have a similar sensitivity up to approximately 7 kHz. Beyond this point, the cat continues to be sensitive, but the Barn Owl’s sensitivity declines sharply. Some Owl species have asymmetrically set ear openings (i.e. one ear is higher than the other) – in particular, the strictly nocturnal species, such as the Barn Owl or the Tengmalm’s (Boreal) Owl. These species have a very pronounced facial disc, which acts like a “radar dish”, guiding sounds into the ear openings. The shape of the disc can be altered at will, using special facial muscles. Also, an Owl’s bill is pointed downward, increasing the surface area over which the sound waves are collected by the facial disc. In 4 species (Ural, Great Grey, Boreal/Tengmalm’s & Saw-whet), the ear asymmetry is actually in the temporal parts of the skull, giving it a “lop-sided” appearance. We at CatSynth hope you all have a fine and enriching Superb Owl Day! It’s been a slow recovery from our latest bout of this year’s influenza and “NAMMthrax,” but we are getting there slowly. Indeed, I have been well enough to spend more time working in the studio again. Of course, if I am in the studio there is a good chance Sam Sam will be there, too. It’s always a delight to have her around. I think she is getting used to all the weird electronic sounds just as Luna did. As a more social cat, I think she mostly just enjoys being near the action. 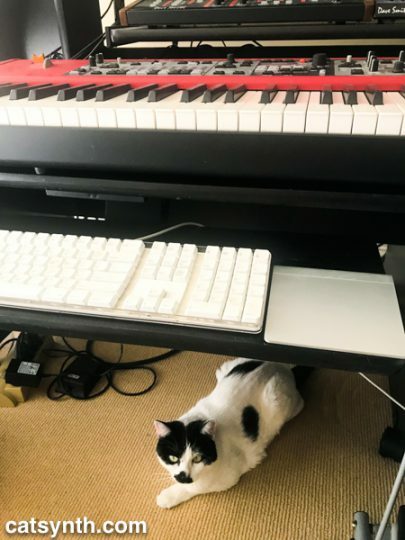 I do sometimes feel guilty when she gets comfy under the main console and I want to use the Nord. It’s a studio musician’s version of the cat-in-lap dilemma. We are going to move forward with some video and music work today, as body and energy permit. We are also doing our part for today’s mass ritual here in the United States with our Superb Owl. We hope you all have an enjoyable day, however you chose to fill it! 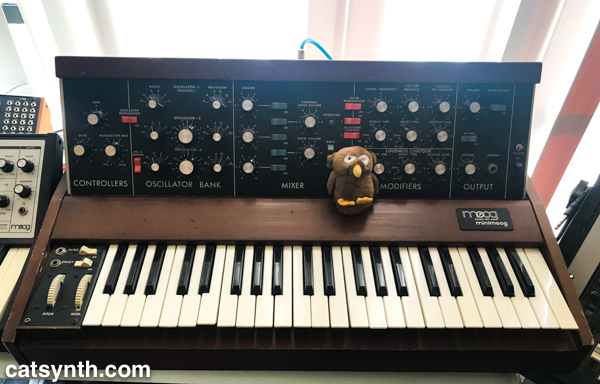 For Superb Owl Day, please enjoy this superb owl on a Minimoog. To mark this occasion, we thought we would share some superb owls. And finally, check out this review of a performance by Tiny Owl.